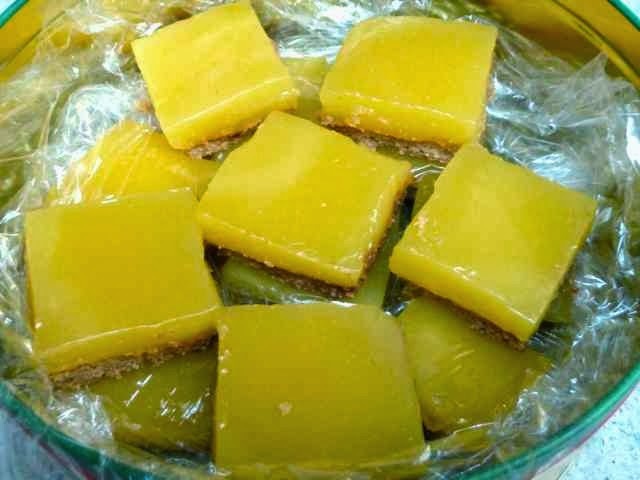 These Tangerine Squares are amazing. I bought a large bag of tangerines for only a dollar and decided to bake something with them. The idea of making a lemon bar using tangerines instead came to me. Some people I know, no names will be mentioned, find lemon bars to be too strong and tart. By using tangerines in place of lemons, the tartness is toned down and the flavor is different, delightful and refreshing. 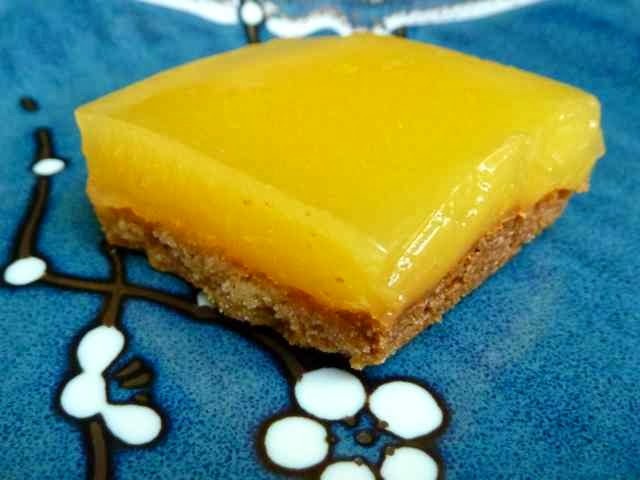 I used my lemon bar recipe and replaced the lemon juice and zest with tangerine juice and zest. It needed a bit more zing so I added some lemon juice and orange extract also. To make a vegan version I made the crust with a margarine (Earth Balance Buttery Sticks-soy free) and made a pudding instead of an egg custard. The vegan version is also quite delicious. **A shout out to the Baking Beauties and Allergy Free Alaska for sharing this on their link up event. Vegan on the left and traditional Tangerine Squares on the right. 1/2 cup Sugar (I used Evaporated Cane Juice Crystals.) You should adjust the amount of sugar according to the sweetness of the tangerines. I suggest that you start with 1/4 cup of sugar and then add more, if needed. 3/4 cup Sugar (I used Evaporated Cane Juice Crystals.) You should adjust the amount of sugar according to the sweetness of the tangerines. I suggest that you start with 1/4 cup of sugar and then add more, if needed. Preheat the oven to 350 degrees. 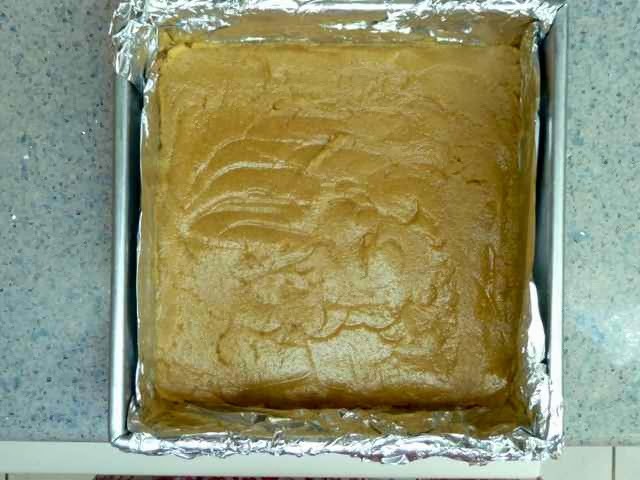 Prepare an 8”x8” baking pan by lining it with aluminum foil. Grease the foil. First prepare the crust. Begin by adding the flours, xanthan gum, sugar and sea salt to a bowl. Use a whisk to mix these ingredients together well. Add the vanilla and melted butter or melted margarine/oil for a vegan or non-dairy crust. Mix together well. Wet ingredients added to the bowl of dry ingredients. Crust dough all mixed together. Press the dough into the bottom of the prepared baking pan. With wet hands pat the dough down as evenly as possible. Crust dough patted into the bottom of foil lined pan. Bake about 25 minutes or until golden brown. Remove from the oven. Allow it to cool. Reduce the oven temperature to 300 degrees. 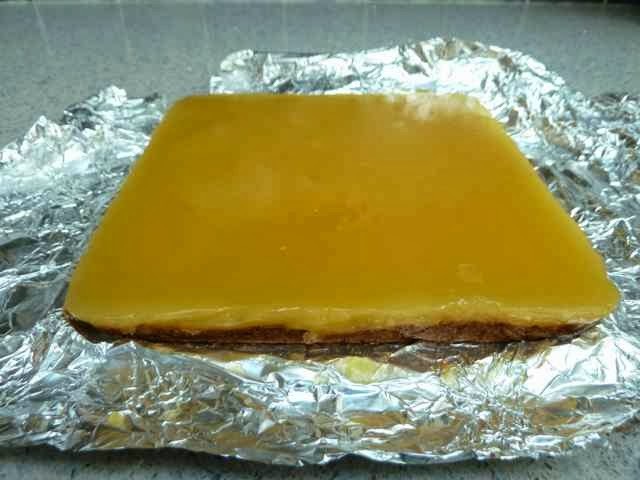 If you will be making vegan/non-dairy tangerine squares you can turn off the oven now. In a bowl add the cornstarch, sea salt and 1/4 cup of the sugar and mix together well. Add the juices, eggs, melted butter or margarine or oil, tangerine zest and extracts. Mix together well. Add additional sugar as needed according to your taste. Custard batter poured over baked crust ready to be baked again. Pour this mixture over the prepared crust. Return the pan to the oven and bake 25 minutes or until the filling is almost set with a slight jiggle. The custard will get firmer as it cools. Cool completely and then cut into squares. 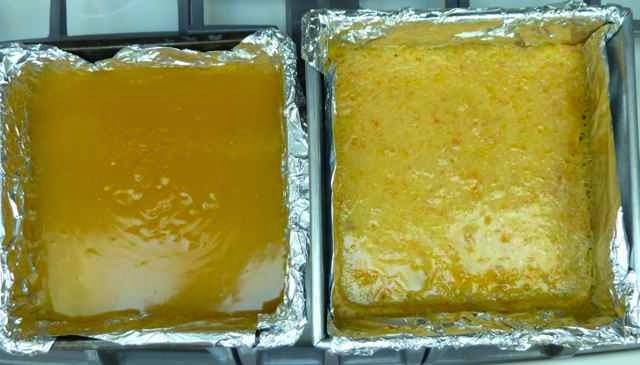 Baked and cooled Tangerine Squares cut into portions. In a saucepan add the cornstarch, 1/4 cup of the sugar and sea salt and mix together well. All the ingredients for the Vegan Pudding in the saucepan ready to be cooked. Note that the uncooked pudding is cloudy. 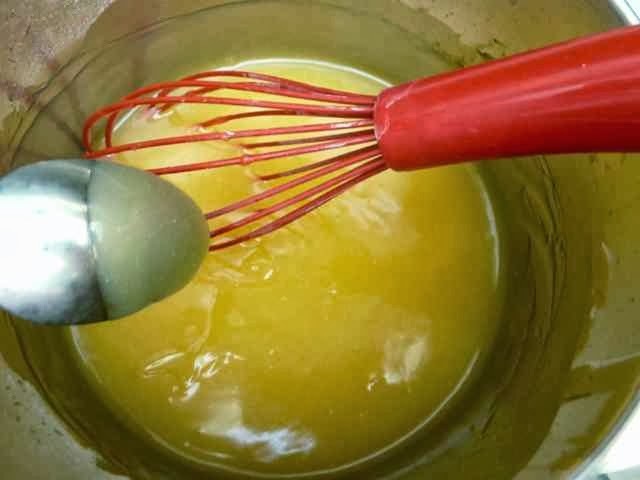 Add the tangerine juice, lemon juice, non-dairy milk, extracts and oil. Mix together well. Cook over a medium heat, stirring frequently, until the pudding thickens and coats the back of a spoon. Remove from the heat. Vegan pudding cooked until thick and it coats the back of a spoon. Note that the pudding is no longer cloudy after it is cooked. Pour the pudding over the prepared crust. Vegan Tangerine Squares cooled in the refrigerator and ready to be cut. Cool completely in the refrigerator before cutting into squares. 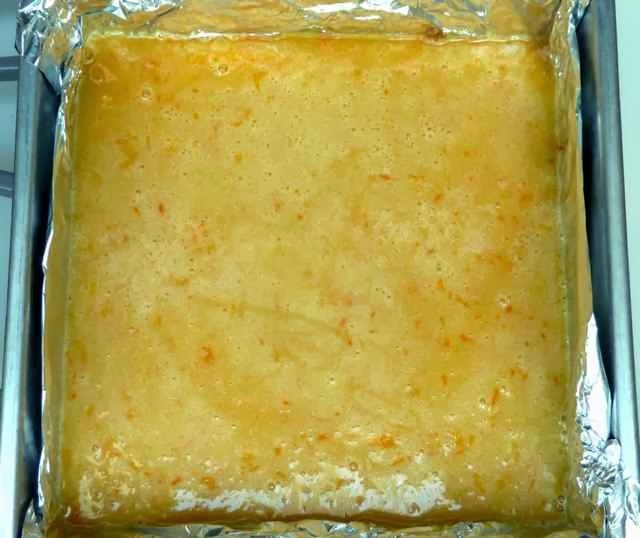 Vegan Tangerine Squares stored in a tin lined with plastic wrap. 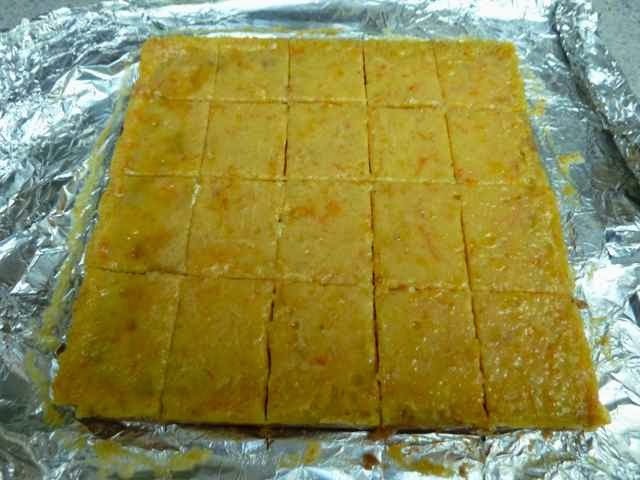 GLUTEN FREE TANGERINE SQUARES CRUST Ingredients 1/2 cup Sorghum Flour 1/4 cup Chickpea Flour 1/4 cup Tapioca Flour 1/2 tsp. 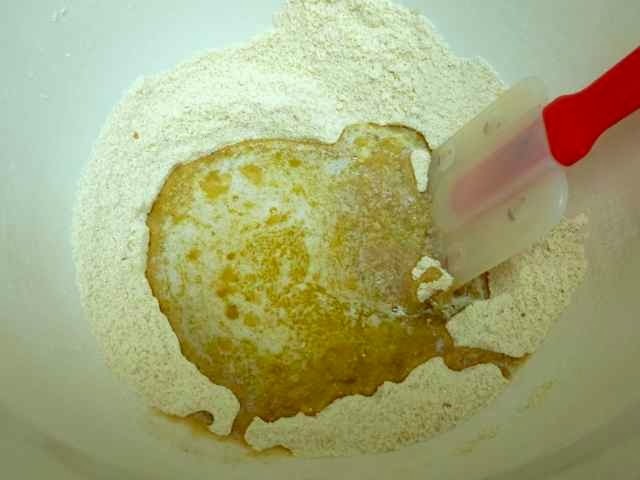 Xanthan Gum 1/4 cup Sugar (I used Evaporated Cane Juice Crystals.) 1/4 tsp. Sea Salt 1/2 tsp. Vanilla Extract - (for dairy free and vegan use “butter vanilla” extract if available) 1 stick/8 Tbs. Unsalted Butter - melted For Vegan/Dairy Free use: 4Tbs. Non-hydrogenated Margarine (I used Earth Balance)-melted plus 2 Tbs. 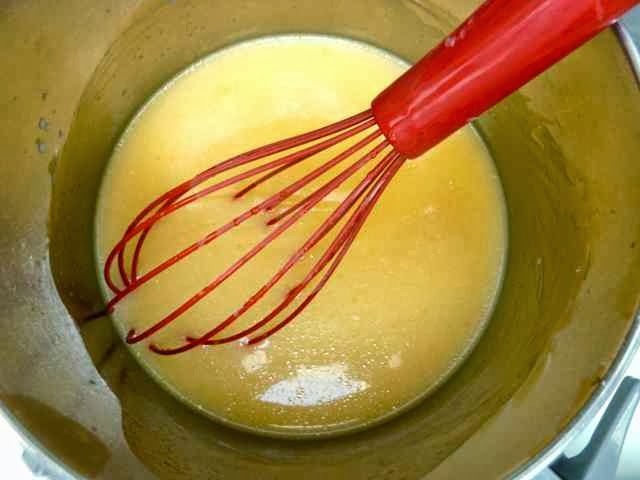 Olive Oil CUSTARD With eggs and butter or margarine or oil Ingredients 1/2 cup Sugar (I used Evaporated Cane Juice Crystals.) You should adjust the amount of sugar according to the sweetness of the tangerines. I suggest that you start with 1/4 cup of sugar and then add more, if needed. 3 Tbs. Tangerine Juice 1 Tbs. Lemon Juice 1 Tbs. Tangerine Zest 1/2 tsp. Orange Extract 1/2 tsp. Vanilla Extract 3 large Eggs 4 tsp. Corn Starch 1/4 tsp. Sea Salt 3 Tbs. 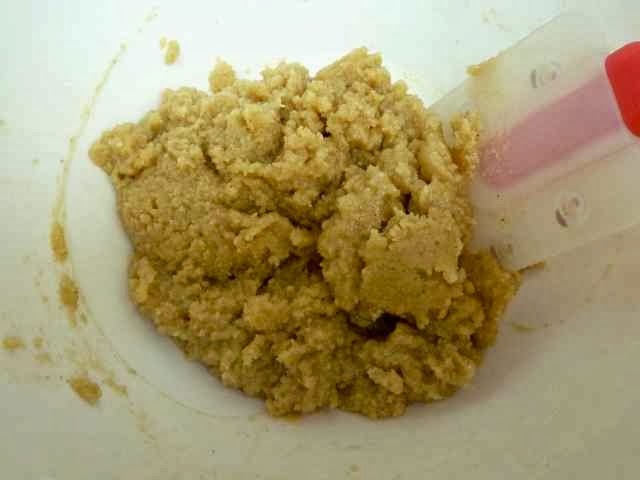 Unsalted Butter - Melted for dairy-free use oil or melted margarine VEGAN PUDDING No eggs or dairy. Ingredients 1 cup Tangerine Juice - freshly squeezed 1 cup Non-dairy milk (I used unsweetened Coconut.) 1 Tbs. Lemon Juice 1/2 tsp. Orange Extract 1/2 tsp. Vanilla Extract 3/4 cup Sugar (I used Evaporated Cane Juice Crystals.) You should adjust the amount of sugar according to the sweetness of the tangerines. I suggest that you start with 1/4 cup of sugar and then add more, if needed. 3 Tbs. Corn Starch 1/4 tsp. Sea Salt 1 Tbs. Olive Oil Directions CRUST Preheat the oven to 350 degrees. Prepare an 8”x8” baking pan by lining it with aluminum foil. Grease the foil. First prepare the crust. Begin by adding the flours, xanthan gum, sugar and sea salt to a bowl. Use a whisk to mix these ingredients together well. Add the vanilla and melted butter or melted margarine/oil for a vegan or non-dairy crust. Mix together well. Press the dough into the bottom of the prepared baking pan. With wet hands pat the dough down as evenly as possible. Bake about 25 minutes or until golden brown. Remove from the oven. Allow it to cool. Reduce the oven temperature to 300 degrees. 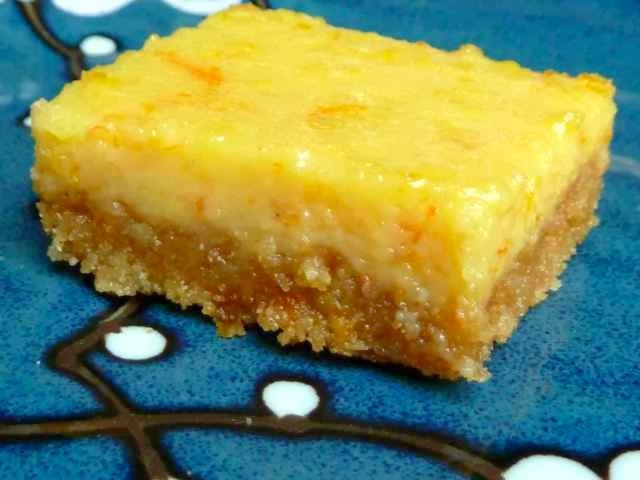 If you will be making vegan/non-dairy tangerine squares you can turn off the oven now. CUSTARD (With eggs and butter or margarine or oil.) In a bowl add the cornstarch, sea salt and 1/4 cup of the sugar and mix together well. Add the juices, eggs, melted butter or margarine or oil, tangerine zest and extracts. Mix together well. Add additional sugar as needed according to your taste. Pour this mixture over the prepared crust. Return the pan to the oven and bake 25 minutes or until the filling is almost set with a slight jiggle. The custard will get firmer as it cools. Cool completely and then cut into squares. VEGAN PUDDING (No eggs or dairy) In a saucepan add the cornstarch, 1/4 cup of the sugar and sea salt and mix together well. 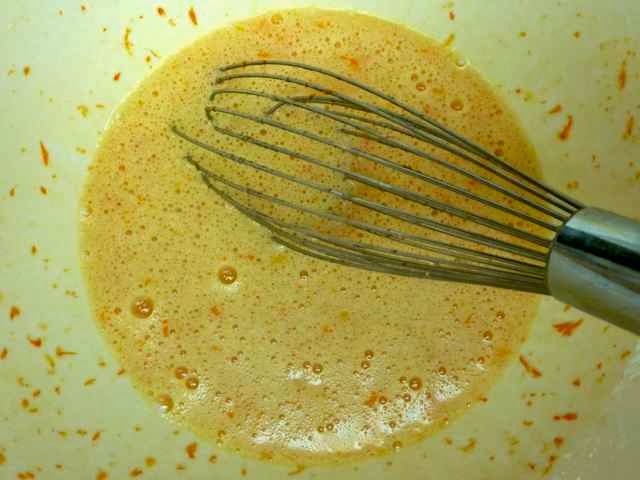 Add the tangerine juice, lemon juice, non-dairy milk, extracts and oil. Mix together well. Cook over a medium heat, stirring frequently, until the pudding thickens and coats the back of a spoon. Remove from the heat. Pour the pudding over the prepared crust. Cool completely in the refrigerator before cutting into squares.